This gift set from Hugo Boss features a matching watch and cufflink set, styled in black and crafted from stainless steel and marked with the iconic Hugo Boss emblem for lovers of fashion-forward sophistication. 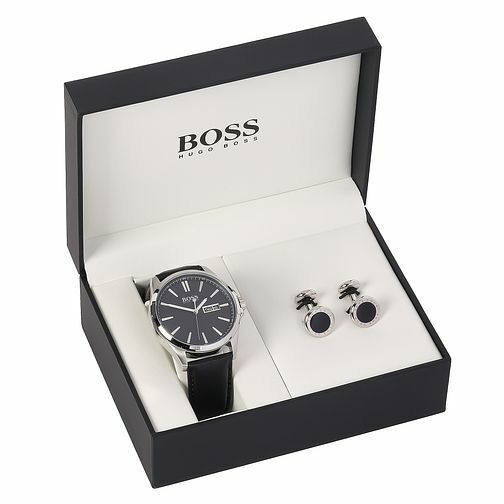 Hugo Boss Men's Black Cufflink & Watch Set is rated 4.7 out of 5 by 6. Rated 4 out of 5 by Anonymous from Great product I bought the Hugo Boss watch and cuff link set, very nice and husband was very happy, i paid for the gift wrapping which made it look lovely but the gift card didn't have any of the writing on that i had written down when ordering it. A little disappointing. Overall the actual product was lovely and definitely worth the money.